The painting at the center of “Conversations around American Gothic,” the new exhibit at Cincinnati Art Museum (up through November 16, 2014), is a classic, yet has a whispered, cautious meanness that allows it to be both poetically absurd and ironically iconic. There’s a Norman-Rockwell plasticity that is about to melt here; a force inside the picture plane is subtly vibrating with harsh concentration, and that blank, fraught determination is both aesthetic and philosophic. Grant Wood doesn’t fool around in this double portrait of two “common folks” who seem bent on being so common they may evaporate into a cloudless day. That feverish anonymity gives their countenances a comedy you can’t really regulate or even describe very well. It’s just something about how their restraint stumbles when given focus, and their discomfort with being the center of the world is somehow touching and unnerving simultaneously. Wood does not actually, when it comes down to it, hate them or even understand them, as much as he finds them glamorously alien: that pitchfork being held by the patrician can read your mind if you let it. In the handsome little family-activity booklet accompanying the exhibit, a question is posed: “Why is American Gothic the most famous American painting?” I guess the answer might be because it is so open-ended and intimidating. 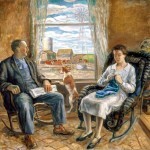 The farm couple can represent stern self-reliance or laughable adherence to old rules; you can read their coupling as shelter from a storm and/or as stasis that creates small-mindedness. In other words, they are brilliantly American tropes that dance around (without dancing of course) what it means to be “independent,” standing their ground to the point they may turn into the background. That urge to disappear into an identity that is both mysterious and point-blank might be the Mythic America the folks who make the penultimate American TV show Mad Men are after (as well as many other great American writers, including Tennessee Williams, John Updike, and Joyce Carol Oates, just to name a few). This American Ideal is about “fitting in” so resolutely that you become some kind of heroic non-entity, tightlipped, perfectly calibrated and continually pissed off, “God Bless America” as an almost silent hiss leaking out eyes and sentences. “Conversations around American Gothic” is a small, tightlipped show that practices what it preaches. It’s installed like a piece of Shaker furniture. 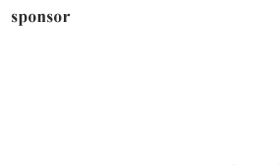 Only eight paintings are included. But those eight communicate to one another so well you feel like you’re in another museum, one that gets rid of dross and frippery and just gives you art that you need, whether you like it or not. Thomas Hart Benton’s 1938 Cradling Wheat has a muscular, roiling backwoods evangelism about it, with its shapes unspooling, it seems, from an exhaustion caused by work and fear. 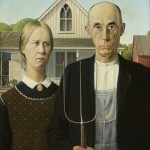 American Gothic’s anonymity gets taken to another place here: we just see profiles and backs as men take the harvest in. And while the painting could be seen as a celebration of the working-class, it’s also a sort of decorously gothic prayer to endless toil. John Steuart Curry is represented by three works, all from 1928-29 – brushy but precise evocations of tornados, baptisms, and “old folks,” farm life given a golden oddness that makes you understand there is a way to represent commonness without being cute or folk-artsy: Curry makes little bits of cinema, burnished into memory, that embolden a myth without losing its core germination. 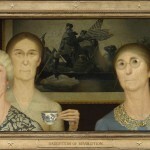 Two other Wood pieces complete the show: 1931’s “Appraisal” and 1932’s “Daughters of Revolution.” Both paintings show us a moment in time that is much like the moment in American Gothic: awkward and concrete, with a side glance borne of disdain. Wood is a parodist with a heart that yearns for a reality beyond a reality that he won’t ever be able to parody. His fury at hypocrisy and snobbery gets channeled into a focus so intense the paintings look like snap-shots from a dream-camera. Both pieces let us in on American hubris in the form of stout, self-assured older ladies who seem to know a lot less than they think they do. (I’m sure Flannery O’Connor was inspired by both pieces; they can be read as still lives she brought to life in her wickedly sardonic short stories). This past week, PBS showed Ken Burns’ epic The Roosevelts: An Intimate History, which chronicles the lives of Teddy, Franklin and Eleanor during much the same time period the paintings in “Conversations” cover: the Depression. This era in Burns’ sober, soporific and yet somehow transcendent documentary is given to us through Meryl Streep mimicry and black-and-white Big Ideas, through the lens of power, politics, and the intimacies that got in the way. “Conversations” flips the script, and gives us imaginative pictographs that bleed through meaning into what it actually felt like to be there. Comic, eerie, off-kilter, and precise, each of these paintings reveal an America solidifying into obstinacy and grandeur, while circumstance and geography start to transform into destiny.